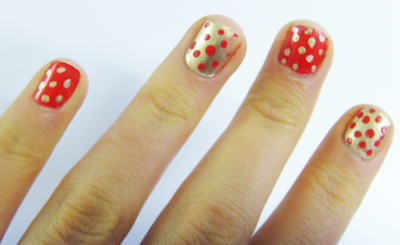 Drawing a bit of inspiration from Gem Fatale’s polka dot nails Tuesday Tip from last year, I created a nail look that reminds me a little bit of Christmas wrapping paper (I’m missing my favourite time of year already). I used the excellent Nailgirls Nail Colours in Gold #2 and Red #1 which are now discontinued, but any colour from the range will work well. The consistency is great for creating smudge free dots – not too thick and very pigmented. After painting my nails alternate colours, I straightened out a kirby grip and dipped it into my pot of polish. A useful tip is to wipe off a bit of the excess onto a piece of paper first so you don’t end up with ginormous splodges of colour on your nails. 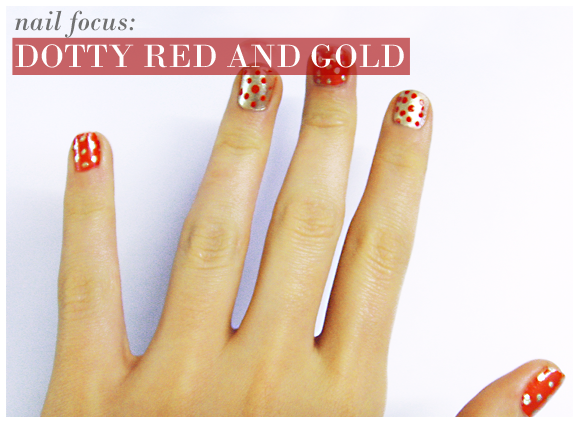 When I was done dotting in gold, I used the other end of the kirby grip to create my red dots. Easy! I love nail varnish and use lots of different brands and colours - but I can honestly say that none have lasted as long as these! I even did a full weekend of DIY, and barely saw a chip! They lasted a full week (which for me is amazing) with only a very minor touch up needed. Plus the colours are so vibrant and 'on-trend'. My new favourite nail brand! This entry was posted on Wednesday, February 29th, 2012 at 10:59 am and is filed under Get the Look, Make-up. You can follow any responses to this entry through the RSS 2.0 feed. You can skip to the end and leave a response. Pinging is currently not allowed.